At 4th line of the page (line begins, “yesh bo...”) For text, click: Here or see below. We discussed the principle of inner mentorship (hashpah pnimiut). It needs to come with intent. The student needs to be addressed for it to be effective. This is what touches the student’s essence. And there is a difference if the student can see his teacher or not at the time of instruction… this indicates that the influence is from the essence. The soul enlivens the body. And the body feels that it is alive, not just that it has life. And this is indicated in the matter of Adam Kadmon – original man. A contradiction of terms… Adam/man is a creation and before his creation he did no exist. Yet original… which goes against the concept of a new creation. A new creation is by necessity not original/pristine. Adam/man is continually drawing from the infinity, into his practical life. He draws from his highest faculties down into his mundane actions. Every step he takes is inspired. We can’t see the truth, because it has not form. And wisdom/chochmah relates to this truth. There is a conceptualization before actualization. He knows the world because he conceptualizes it, not because he experiences it. Animals do not begin from conceptualization, but from experience. Chochmah connects heaven and earth. At top of the page (line begins, “vehinay...”) For text, click: Here or see below. We explained how the soul and the master/mashpia give internal hashpa-ah (mentorship) that intentionally changes their subject. The mind of the student is not just illuminated for a moment, but his own sechel/insight begins to function differently. The intent of the master/mashpia is to give of himself. It is this intent that opens new vistas to the student. It is not a matter of the transfer of information. At about 8 lines from end of page (line begins, “ohr...”) For text, click: Here or see below. We are saying that light from essence in not a natural progression. We think of daylight. The energy is not light per se. Then there is the effect of light from the sun. It is not something that can be experienced directly – since it is all encompassing. Then there is the presence of the sun. It has a completely different effect. Sunrise brings not light but the sun itself. What’s the difference? Light knows darkness. But the sun is not in contrast to darkness. Darkness does not exist in the sun. It is the essence of light. This is like the guest and the host. The host serves lunch. But if he says, ‘here, enjoy I’m leaving’, then nothing is left… the guest would be bereft. This is indicating a light/presence that does not have a process. The revelation from essence is not by process, only by His will. This means the light/revelation is coming by means of his will, and not from His essence. The sun illuminates, but the objects are left unaffected after the light leaves. Soul influence (hashpah) is internal and the student is forever changed by the new perspective. The master works to reveal what both he and the student already know internally. The student knows that he personally is being addressed. At 9 lines from top of page (line begins, “mikol makom...”) For text, click: Here or see below. At 8 lines from end of page (line begins, “ukmo ken...”) For text, click: Here or see below. We are speaking about light in 2 different domains. The light that comes into creation – light of the kav/line that is able to create worlds. And then there is the initial light that is above world yet it is still light, since it is a revelation from essence. 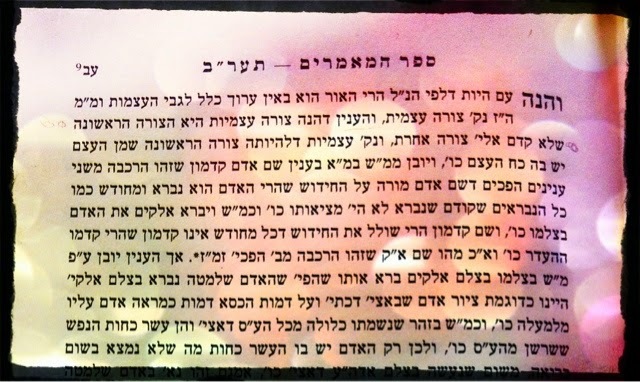 Below middle of page (line begins, “legubay ha-etzem...”) For text, click: Here or see below. We are learning about the relationship between the light and the essence. Usually the light reflects the source/essence. But above that relationship does not exist since essence has not feature or presence that can be expressed in ohr/light. Light by definition has some kind of a function. Essence has no function. There’s a profound effect in understanding these topics. Light from essence is only due to a pro-active will. This means for us that all existence is entirely by intent and focus – ‘this is what He wants’. There is nothing inadvertent. At the middle of page (line begins, “ohr...” @ umemayla) For text, click: Here or see below. In essence the light is not reflective of it. There is nothing that compels the essence to produce light. And the light that the essence gives is not representative of any ‘quality’ of essence. In this world physicality cannot be destroyed. This is because its presence is a gilui of essence. We do say about the essence, that it is the First Being… and it does not have a ‘where it is coming from’. It does not beg the question of its origin. • Atzmus is unlike any other etzm, such as the sun or the nefesh. • The sun and the nefesh each consist of some kind of definition. 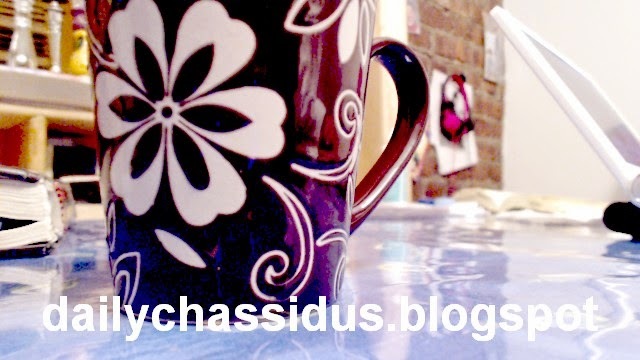 For example, the sun is essentially bright (bihiri) and the nefesh is essentially life (chai). This brightness and life, however, are essential not functional. This means that the essential brightness does not consist of light; similarly by chayus. Nevertheless when light comes from the sun, it is correct to say that this is a guili from the etzm. 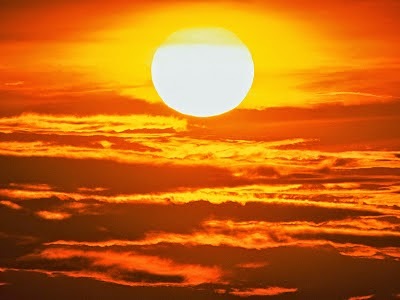 The functional light that comes from the sun is somewhat related to the essence of the sun because the essence of the sun is bright, albeit on a different realm than functional light. • By atzmus, there is absolutely no definition. • Last night, we spoke about the term “mechayiv.” Mechayiv means that its significance depends on it being recognized. We gave several examples. One was money. • There’s much more but I don’t have time right now. • The real significance of something does not convey just because the thing is there. We need to recognize it This goes with the term “mechayiv.” Someone can have money that can sit in the bank, but he totally doesn’t appreciate it or know the significance of it. The money requires that you recognize its significance. This is unlike a wall. It provides shelter whether you recognize it or not. • Ohr that comes from Atzmus does not come from Atzmus automatically. It can’t because atzmus has no definition or quality whatsoever. Any ohr that comes from Atzmus comes because Atzmus wants it. Yet, we still call it ohr, which means that it reflects Atzmus. This is literally a contradiction, an impossibility. But Atzmus can accomplish the impossible. • This ohr from Atzmus is so significant because it reflects a supreme reality. • Earth matter is indestructible. This is so not because of the earth, but because the earth is a manifestation of Hashem’s will, which is infinite. When we doven (pray), we don't share Hashem's attention with anyone else. Hashem wanted that His presence be totally present for everyone who dovens to Him.